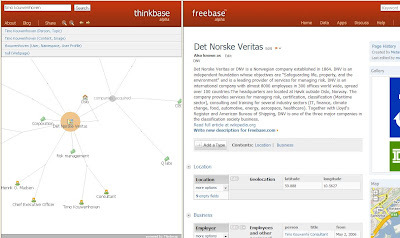 Thinkbase allows people to visually explore the relationships that Freebase can expose. Thinkbase employs the Thinkmap visualization software to visually represent the semantic relationships between objects on Freebase as an interactive mind map. Each object on the map is represented by an icon that corresponds to the type of object it is. For example, person, place, movie, song, or artwork. The site uses a two-pane display, putting the relationship map in the left pane, and the Freebase entry for the active node in the right pane. Every node on a Thinkbase map and be expanded to see concepts related to that object, or collapsed to clean the graph of relationships you're unconcerned with. Every map you create can also be linked to via a dynamic share URL. Thinkbase is a usefull visual front end to the Freebase database that exposes the semantic relationships that such a database can reveal in a compelling way. Tools like Thinkbase can help us start to think about what type of questions we should be asking by clearly showing the type of semantic relationships that databases like Freebase excel at finding.